What have you been up to today? I’ hope you’ve had the chance for some play time too amidst the seasonal madness! Great plan, the block is so fun. Cool block, and are you feeling better? 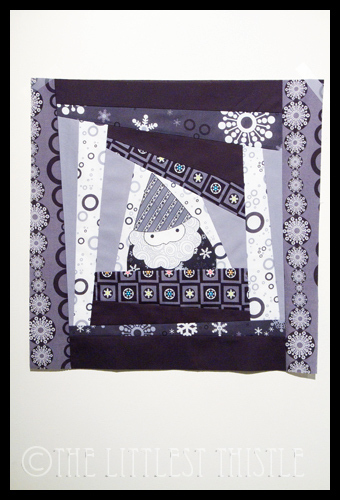 Great to see you sewing those little Santas, your quilt plan sounds great! Looks fab! Ad so big too! I've been out with the man visiting local historic hall 🙂 but tonight I've stitched 2 AMH/ tana lawn infinity scarves :). I think I'm in love! Hope you're feeling better! You could persuade me to do wonky! Nice block. Yay! So glad you got some winterkist fun in – great block. Very cute. Glad you got some time to have a play. OOOOw… I do love that block. Just Fab. It looks a cold chilly night. Wonderful block – such cute fabrics! The block is gorgeous Katy – this is going to be gorgeous. I have been working like a dog but worth it as nearly done. It looks marvellous!! Are you feeling any better today?